Chemical Oxidation is an in situ remediation technology that can be applied to groundwater or soils and many different contaminants. It is a chemical technology where strong oxidants are injected or mechanically mixed into the treatment zone to promote destructive abiotic degradation reactions. It is commonly used, applicable to many hydrogeologic settings, and relies on well-known technologies such as injection and mixing. Because of stoichiometry and mass balance limitations, it may be inefficient when applied to treat free-phase (i.e., free-product or non-aqueous phase liquid (NAPL)) zones. In situ chemical oxidation (ISCO) is a mature technology for remediation of contaminated groundwater, including both source zones and contaminant plumes. ISCO involves the introduction of chemical oxidants into the subsurface to react with contaminants to convert them into less harmful products. Commonly used oxidants include Fenton’s reagent, ozone, potassium permanganate, and sodium persulfate. Treatment objectives for ISCO have ranged from reducing contaminant mass within a source zone to meeting maximum contaminant levels (MCLs) in a plume. The effectiveness of ISCO varies as it is highly dependent on proper site characterization, ISCO design considerations, and oxidant delivery system design. One study evaluated the performance of 70 chemical oxidation projects at chlorinated solvent sites in terms of the reduction in source concentrations before and after treatment. 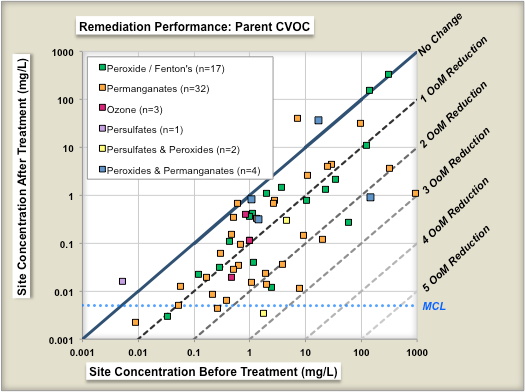 Figure 1 shows change in geometric means of parent compound (left panel) and change in geometric means of Total CVOC compound concentrations (right panel) as a result of ISCO treatment. Each symbol is an individual in situ remediation project at a specific site. 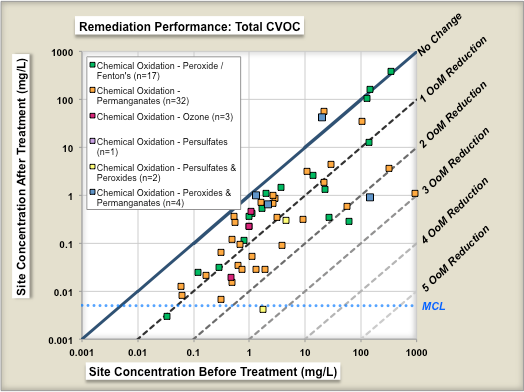 The geometric mean of the before-treatment zone concentration is shown on the X-axis, and the after-treatment zone concentration is shown on the Y-axis. The different colored symbols represent different ISCO technology subtypes. The median project was able to reduce the parent compound concentrations in the treatment zone by ~84% (0.8 Orders of Magnitude or OoMs). Figure 1a. Change in maximum parent compound concentration by technology variant for chemical oxidation. CVOC = chlorinated volatile organic compound. Figure 1b. Change in maximum parent compound concentration by technology variant for chemical oxidation. CVOC = chlorinated volatile organic compound. Table 1. Categories for ISCO remediation effectiveness (adapted from Siegrist et al., 2011). Most of the common organic contaminants can be destroyed by one or more of the oxidants. ISCO has been primarily used to treat organic chemicals, including chlorinated solvents and fuel and petroleum hydrocarbons. There are other contaminant types, though, for which ISCO is not recommended (Table 1). Often these conditions that challenge ISCO as a stand-alone technology can be overcome through an ISCO treatment train approach (e.g., ISCO followed by in situ monitored natural attenuation). Also, ISCO typically requires a targeted second or third oxidant delivery event to manage contaminant rebound, which is common following single injection events. Successful ISCO treatment requires matching an oxidant to the contaminant of concern and site conditions, using an effective delivery approach, and sustaining an adequate concentration of oxidant for a sufficient period of time so contaminant oxidation can occur. It is also very important to consider health and safety while planning and implementing ISCO. ISCO oxidants are strong oxidizing agents. Workers must be properly trained and equipped with proper protective equipment, ISCO operations must be carefully monitored, and oxidants must be properly stored.